In response to numerous queries by our customers, and members of the public, we would like to give some FREE, HONEST and IMPARTIAL information about Reverse Osmosis Drinking Machines (particularly the ones that come in 2 parts: filters and water vessel). We would like to note first of all, that we have nothing to gain by giving you this information as we do not install these systems any longer anyway. They are only guaranteed to supply potable drinking water if your supply is already classified as potable drinking water. (Don´t just take our word for it. This is also stated within the instruction manual in small print! )We have not yet come across a mains water supply in this area that IS classified as drinking water. They constantly waste water, even when you are not using them. We recently performed a test for a client who has one of these units under their kitchen sink, who couldn't work out why their water bill was so high. The waste pipe of the unit was disconnected and put into an empty 1.5 litre water bottle. Within 5 minutes the bottle was full. Our calculations therefore showed that over the course of 7 days, the unit was pushing approximately 3000 litres of water straight down the drain!!! (Incidentally, if you have a water deposit and pump system, and you notice your pump switching on for a few seconds at regular intervals, and you have a drinking machine, this could be the reason). If you do already have a Reverse Osmosis Drinking Machine or integrated Britta filter, and you also have or are thinking about having a water softener installed, please ensure that the drinking machine has an independent water supply. 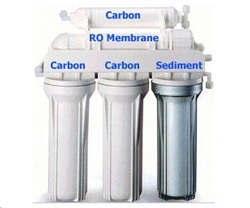 Reverse Osmosis machines and Britta filters should not be installed downstream from a water softener. (Once again, don´t take our word for it. This is also in the manual).